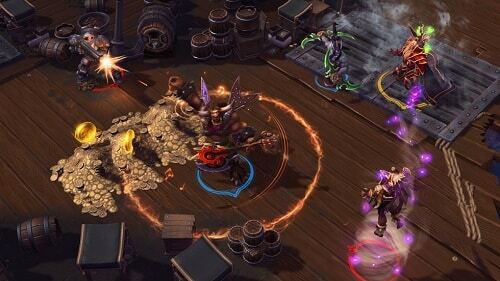 Blizzard tackles the thriving MOBA genre with Heroes of the Storm. After a healthy amount of time in beta the shackles are off this high quality free to player experience that tries to take the genre in new directions while bringing veterans and beginners together for battle. Often referred to as a hero brawler by it’s creators the game revolves around 5v5 matches where various Blizzard creations take the field of battle. You’ll have character options from the Warcraft, Starcraft and Diablo universe which fill typical team roles from support, warrior, assassin and specialist. Taking control of a favourite character from a Blizzard game is undoubtedly one of the best assets of the game. 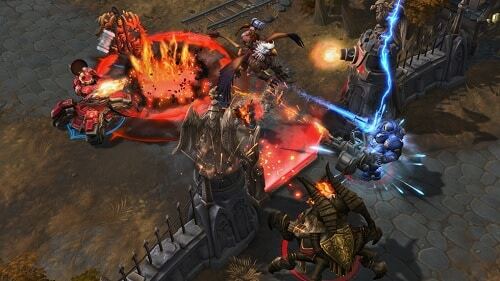 So where does Blizzard draw the line between more traditional MOBA games? First is the multiple maps that the game brings to the table (7 at launch), while these have a similar 3 lane design for the most part the layout, objectives and settings are very different and can create completely different gameplay. This ties into quite possible the second biggest shift away from the typical experience in this genre. Unlike other MOBA games where you’ll focus solely on pushing onward to your enemies base Heroes of the Storm focuses more around objectives on the map itself. These objectives help facilitate more action and bestow great temporary powers onto the team that is capable of controlling them. Beyond these unique aspects players will also quickly discover the lack of individual levels within the game. Heroes of the Storm has instead opted for a shared team level which helps to keep characters at relatively equal strength and won’t let a teammate fall behind. Roughly every 3 levels players will gain a trait point which allows a skill to be unlocked, with a number of different options here the game offers sizeable room to alter your strategy for the particular match. With various mercenary camps, minions, skins, ranked matches and even the ability to test your heroes before you buy rounding out the adventure Heroes of the Storm has everything you could want and more. 5v5 battles across multiple maps. Objective based gameplay without an item shop. Large collection of heroes from various Blizzard games. Defeat mercenary camps to bring them to your side temporarily. Choose the right skills for the individual match.